Recent release “A Day in the Life of Emi Lulu: The Adventures of a Five-Year-Old” from Page Publishing author Debi Pschunder is a delightful collection of four stories in the life of a little girl named Emi Lulu during the summer she turns five years old, as she throws a big birthday party, visits the beach, goes swimming, and watches the fireworks, reminding everyone that life can be an adventure. Debi Pschunder, a mother, stepmother, and grandmother who has worked in day-care and currently as a preschool teacher, has completed her new book “A Day in the Life of Emi Lulu: The Adventures of a Five-Year-Old”: a lively book of simple joys and summer adventures. polka-dot dress with the white ruffles the best. I will ask Mommy to put my hair in a ponytail. It is eleven o’clock, and I am waiting for my friends to arrive. I hope they get here soon. I can’t wait to see them. Published by New York City-based Page Publishing, Debi Pschunder’s new book is an inviting reminder that the simple pleasures and time spent with loved ones are enough for a happy life. As children join in Emi’s adventures, they are encouraged to joyfully recall the adventures they’ve had with their own friends and family. 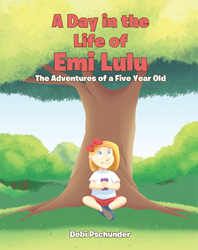 Readers who wish to experience this charming work can purchase“A Day in the Life of Emi Lulu: The Adventures of a Five-Year-Old” at bookstores everywhere, or online at the Apple iTunes store, Amazon, Google Play, or Barnes and Noble.